"Maybe he will understand IRHAL in Chinese"
Then comes the Chinese 出发, which is phonetically annotated with Pinyin, chūfā (tone mark missing on second syllable). I shall discuss the meaning of the Chinese word below. "He doesn't understand ANY language!" Some Westerners have speculated that the protesters are using Chinese on their signs to reach out to the Chinese people, presumably wishing to spread the wave of democracy now washing over the Arab world. Most Egyptian acquaintances, however, consider that to be naive, wishful thinking. As one Egyptian correspondent wrote: "Nothing to do with spreading democracy to China. Just sarcasm and humor about Mubarak’s inability to 'understand' Arabic and understand what the protesters have been telling him: "To leave". Some signs say that maybe Mubarak only understands Hebrew, etc. 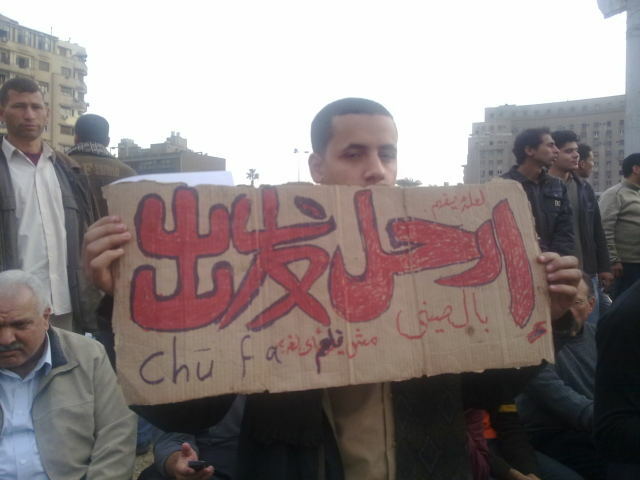 Other signs 'explain' to Mubarak that "Irhal in fusha means Imshi in colloquial." In other words, "amscray," "get out," or, more politely, "leave." "The Egyptian people demand that President Mubarak step down". I would say that the calligraphy on the poster is quite respectable for a non-Chinese, especially for writing on such a large scale. There are a few errors (I won't point out all of the minor problems that a teacher of first- or second-year Chinese might correct on student homework), such as the miswriting of the -qiú 求 of yāoqiú 要求, the missing cross stroke at the top of -kè 克, and the wrong position of zǒngtǒng 总统 (president — it should come after Mubarak's name, not before it). Still, questions remain for this second sign: to whom is it directed? what is its purpose? This is pure brilliance. You were wondering recently whether the Chinese understand irony. The Egyptians obviously do. @VM: "The Chinese expression is actually not the right choice of word for what the Arabic and English mean. Chūfā 出发 means "leave" only in the sense of "depart," not "step down from a position." Actually, the Arabic word used 'irhal' also means go away, leave, depart. But, it certainly in his context, would also imply stepping down and leaving for good. For what it's worth, I blew up the final picture, and I'm fairly certain the Arabic text just says ارحل يا مبارك, irhal ya mubarak, Leave, Mubarak. And given the level of snark I've seen in photos from the demonstrations, "roll out of here like an egg" seems perfectly appropriate. Maybe the Egyptians have noticed which country's going to be the superpower of this century. Despite the mistakes, I'm sure that second sign was written by someone who has studied Chinese. The way the characters are written shows an understanding of stroke order (a ignorance of which is the biggest give-away in hanzismatter-type tattoos, for example). According to this Wikipedia page the target language in Arabic for the English "It's Greek to me" is Chinese. I think "leave" is exactly what the protesters mean. They are responding to Mubarak's statement that he would die in Egypt. Dictators aren't ever out of power until they leave the country or die (e.g. Putin). And I think Faldone has it right. They are making a complex word play on the expression. That means the target is us (the international community of language geeks). As Faldone said, I would expect that the choice of Chinese has a lot to do with its perceived difficulty/the expectation that one wouldn't know it. After all, if Mubarak isn't understanding more common languages , Chinese is the last stop before giving up on linguistic communication altogether. 出发 means "leave" in the sense of "depart", as Victor explained, but more specifically it means "set out on a (planned) journey". In other words, it focuses on the departure as the beginning of a new, typically positive, episode for the person leaving. I think the protesters, on the other hand, are saying "leave" in the sense of "put an end to your presence here", and 出发 is not the right translation for that. The only thing I see from this is that the Chinese language is more popular than before, as a language used by world's people. "Still, questions remain for this second sign: to whom is it directed? what is its purpose?" To get noticed by media. At virtually any demonstration or protest anywhere in the world, there are signs held up in English; and these are, strangely enough, always the signs that get their pictures on BBC, CNN, etc. This was surprising to me until I realised that the English signage could be a comparatively small fraction of the signs, and they'd still be the ones we'd see. And it seems likely that there would be signs in various other world languages as well, for the same reason. In the case of China in particular, there are multiple possible targets: it need not be an attempt to get through to the Chinese people in general; it could be an attempt to get through to the Chinese government, various other east-Asians, or possibly to the Chinese investors that have lately been pumping so much money into developing Africa as a sphere of influence…. @Jesse Tseng; 'irhal (imperative of rahal) also means depart and carries a connotation of permanent departure. As an example, it can be used euphemistically to refer to death. There is a saying in Arabic "Seek knowledge as far as China" ﺍﻃﻠﺐ ﻋﻠﻢ ﻮ ﻟﻭ ﻓﻲ ﺍﻟﺼﻴﻦ . This is a "weak hadith", meaning the chain of transmission from The Prophet is not as reliable. There may also be a hidden Sufi meaning to the hadith. In Arabic the word “China” is SYN which decodes to form a word, QN, which is said to represent, in Arabic, the concept of “scrutinizing, observing”, and is therefore taken as a symbol of concentration. Although this may be an overly mystical digression from what the sign maker intended. I hardly think 滚蛋 would be too "crude and derogatory" given how much shoe-waving treatment Mubarak's already gotten. What is the Arabic equivalent of "it's Greek to me"? In Hebrew it is indeed "Chinese"… (In German it is Spanish). Just noticed that the last few strokes in 穆 are written in a cursive hand. 球, qiu = ball and is written incorrectly. It should be 求, qiu without the left hand radical if you want to express "to request, to beg, to implore, etc…"
The last syllable of Mubarak's name, from the writing does not exist. It should be "克", pronounced "ke". 克 means "to overcome" but here is used only for its phonetic value, which is the k of Mubarak. Mubarak = 穆巴拉克, "Mubalake" in Mandarin Chinese. "developing Africa as a sphere of influence…." UH… If you never noticed, Egyptians are mostly Islamic, so they consider themselves from the Middle East/Arab world/Magreb, but NOT from Africa!!! "and the wrong position of zǒngtǒng 总统 (president — it should come after Mubarak's name, not before it)." You are wrong, The title of president is before the last name NOT after it. 总统奥巴马 is correct for President Obama, NOT 奥巴马总统, which means "Obama the president", which is almost never said. 总统穆巴拉克 is perfectly acceptable Chinese as on the sign, whereas 穆巴拉克总统 is incorrect. PS I don't know if the commenter is a beginner of Chinese or not. You're going to have to elaborate on this, since search engines find literally millions of instances of "奥巴马总统", including Xinhua articles and government websites. 总统奥巴马 is even more common (and note that some of the links above use both forms), but in every single instance I've seen, 总统奥巴马 is preceded by a modifier, typically 美国 "America" (as in 美国总统奥巴马 "America[n] President Obama"). Mubarak's name and title evidently aren't treated any differently — the first headline has 总统 first and preceded by 埃及 "Egypt", while the second has an unmodified 总统 following Mubarak's name (as does the protester's sign). Maybe there's something else that makes the protester's sign incorrect or unidiomatic, but saying the title of president is "almost never" used after the surname is a stretch at best. Search engines turn up literally millions of results for 奥巴马总统, including Xinhua articles and government websites. 总统奥巴马 is even more common than 奥巴马总统, but in every instance I've seen 总统 is preceded by a modifier — typically 美国 "America," as in 美国总统奥巴马 "America[n] President Obama." 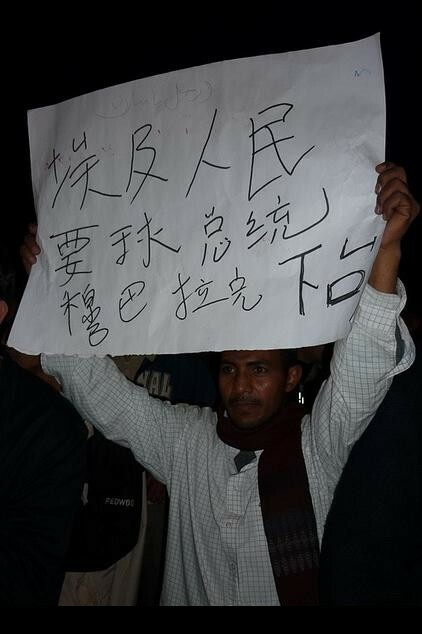 Mubarak gets the same treatment: the headline here has a 总统 preceded by 埃及 "Egypt" before Mubarak's name; meanwhile this one has an unmodified 总统 after it, as does the protester's sign. Perhaps the sign is unidiomatic in some way, but to say the title of president "almost never" comes after the surname is really stretching it. Apologies for the (sort of) double post — I seem to be having cache issues, since the first post never showed up in my browser until now. the egyptian ppl wants ball President Mubarak to step down…. I used to joke about America being the State of Rice. 美 mĕi = the "me" in "America," just like the 米 in the Japanese name. As a mainland Chinese who have never stepped out of Communist's regime, I am so excited and amazed by the brave and creativity of Arabian people, firt Iranians, then Tunisia, and now Egypt people!!! We have the same language and disgust to dictatorship and desire to tear down it! You inspired us!!!! The commuinst authoritarians are tasting disregard by Chinese people, and I believe the color revolution and internet revolution is begin in China and will soon collect it's power, Chinese people, let's ChuFa! 出发! Lareina, it seems that you hated America, can I ask – is your father Li Gang? 你爸是李刚? "Nothing to do with spreading democracy to China. Just sarcasm and humor about Mubarak’s inability to 'understand' Arabic and understand what the protesters have been telling him: "To leave". The purpose of communication is to pass on the message. Since the message has been conveyed why bother about the word order or spellings? put the word "总统"(president) before the name is not an error. If you write "president" after "Mubarak" in Chinese, it means "We demand (Our) president to step down. ", and if you put "president" before "Mubarak"(as it shows in that board), it tends to mean that "We Egypt people tell you (chinese), we demand the current Egypt president Mubarak to step down." Simply put, the sentence as they showed, is not showed to Mubarak, it is showed to Chinese (that we egyptian indeed want Mubarak to step down, just in case you mistake us as Mubarak's supporter), they may know that chinese official Media may misguide chinese people in that issue. The man who posted it online put a line behind it: "Just in case chinese are watching."